Automobile accidents are a major concern in our community and one of the leading causes of personal injury experienced by our clients. About half of all automobile accidents are multiple vehicle accidents, meaning that two or more vehicles are involved in the collision. When we meet with our San Diego clients who have been involved in a multiple vehicle auto collision, determining the cause of the accident is important in helping us pinpoint who is at fault. When another party is at fault for the accident, personal injury attorney Chris Olsen can help clients collect their rightful compensation. Negligent driving: When multiple vehicles collide, the cause is often negligent driving on behalf of one or more of the involved parties. While there are obvious acts of negligence such as driving under the influence and making unsafe driving maneuvers, speeding, texting while driving, and driving while distracted are also examples of driver negligence. Poor road conditions: Bad weather, such as fog, rain, and snow, can create poor road conditions that make it difficult to see other drivers or difficult to stop a vehicle in time to prevent a collision. Other road conditions that can cause multiple vehicle accidents include road signs that are not easily visible to drivers or speed limits that are set too high for the conditions of the road. Defective car parts: People rely on their cars to keep them safe by functioning as they are meant to do. Unfortunately, it is not uncommon for defective parts to be overlooked and placed in vehicles. Defective car parts can prevent the car from steering, braking, or otherwise functioning in a safe and effective manner, and may result in a car accident. In a multiple vehicle auto accident, there is always a party at fault for the collision. Whether that party is one of the drivers involved in the accident, the department in charge of maintaining road safety, or the manufacturer of a vehicle or car part will depend on what caused the accident to occur and if any negligence was involved. As an experienced car accident attorney, Chris Olsen seeks compensation for his clients who have been injured as the result of a multiple vehicle accident. By investigating the details of the case, Mr. Olsen can determine who is at fault for an accident and what compensation is due to his clients. 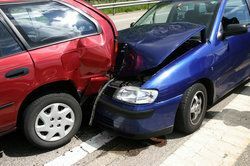 In a multiple vehicle auto accident there is likely to be many insurance companies and lawyers involved, so it is important to ensure that you have someone looking out for your best interests. If you have been involved in a multiple vehicle accident, contact us to schedule a free consultation with personal injury attorney Chris Olsen. Mr. Olsen can represent your case and fight for fair compensation for damages suffered.